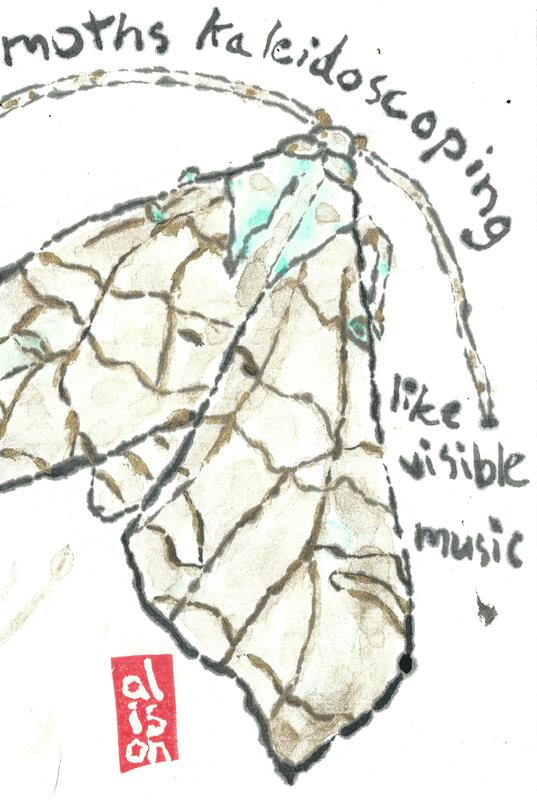 Moths kaleidoscoping, and a note on Swamplandia! I don’t buy many books. I’m a librarian. I patronize my public libraries (and thankful that Washington, DC, has excellent ones, especially my local one Watha T Daniel-Shaw!). And I like audiobooks for my 3 mile walks or runs to work. But… a month ago, I was in Kramers, a local bookshop, waiting for someone, and found myself skimming Swamplandia! by Karen Russell. Her language really pulled me in, and even though I am not usually interested in stories narrated by kids, I bought it on the spot. Since then, I have found this blog post on Wormbook that identifies this precise passage as one of her main issues with Russell’s Swamplandia!, noting the “conflict between tunelessly and music/audible.” And Wormbook is right, when you think really hard about the passage, it is jarring, and seems a little like Russell went too far in her language. Yet, still I love the imagery it brings to mind, and I have paraphrased Russell in this etegami of a moth. I used brand new paints my sister gave me for my birthday (thanks Jessie! you must really love me, look how much they cost!!! ), taking advantage of the gold and the aqua blue-green. And, if you think I was going a little too crazy with my color scheme, I had found this image of a moth on Pinterest, and used it as a model.